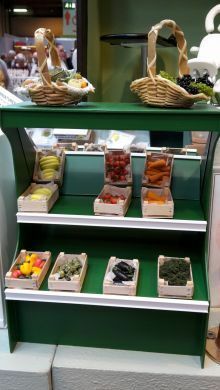 We make a really wide variety of fruit and vegitables and on this page you will find that they are packaged in traditional wooden crates in the main. 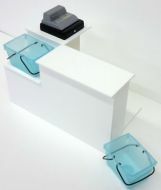 If you're looking for more modern packaging then you can go to our 'Greengrocery In Printed Cartons' page. 1/12th scale. , This box of Aubergines, would add an unusual touch to your miniature fruit &, veg store. 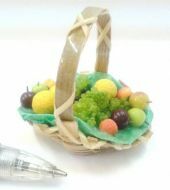 Fabulous basket of mixed fruits including oranges, apples, peaches, grapes etc. 1/12th scale. , To enhance your miniature greengrocery shop, what about this unusual box of Broccoli ? 1/12th scale. , The ever-popular Carrots are presented in a wood box.